Move over birds and pigs, reptiles and marine creatures are the new fight buddies! Rovio’s Nibblers brings a unique match-3 battle game featuring cute aquatic animals and grumpy lizards. You will be helping Coral and her gang fight those sneaky reptiles for food by matching fruits. Don’t give the lizard any room to move. Set a trap by having at least two Corals either in two columns/rows side by side or in every other column or row. This way, the lizard will have very few rows/columns to move, plus there are fruit matches to make, making it very difficult for him to escape. Corals are probably the easiest to create as you will have to match only 4 fruits to get them. Having one or two Bitelings can also make it harder for him to move. Bitelings launch in all four directions and so they can defeat more than one lizard if they appear on their way. Launch your Bitelings when you see more than one moving reptile on their path, either up, down left or right. You will need to make a crossing match to add Bitelings to the game board. If there is a way to destroy a moving lizard with fruit matches, then don’t use your precious aquatic creatures to gobble him up. Some levels will throw a mix of lizards and if there are shell, mud and moving reptiles, then your first target should be to attack shell and mud lizards as they can’t be defeated by matches. Remember: A moving lizard pushed to the ground, and stunned because of a fruit match, can’t move. Keep an eye on their movement pattern and look for matches next to a sand block or bush. Your first priority should be to destroy as many sand and bush blocks as possible, either by fruits matches or by launching aquatic creatures and make way or more fruits from the top of the game board. You need only one fruit match to break a sand block, and two matches to destroy a bush. Once a moving normal lizard is pushed to the ground, it will take two more matches or a single nibbler attack to destroy him. He is big and covers more tiles than a Coral. Match five fruits of the same type to get Octo. Once you get him, use him wisely. It’s not easy to get 5 fruity matches every time. If you get one, use this creature when you spot more than 2 reptiles appearing in its path. If you spot Bitelings or Coral appear in Octo’s path, just launch him. Along with him, these creatures will also be launched removing plenty of fruits and maybe lizards. This will also make way for more fruits from the top, and may trigger a combo match. Whether it’s an Octo, Bitelings or Coral, you can see what path they will race to by just swiping and holding the screen. This can be useful if you want to see how many reptiles appear on their way. Once stunned, a moving lizard cannot hop from one tile to another. However, he will again start moving if you fail to make a fruit match next to him in the next few turns. So make sure you get rid of him immediately before he starts moving again. Once he comes back to his senses, he will start his usual antics and you will again have to match fruits next to him twice to defeat him. Bouncer is the “Mighty Eagle” of the Nibblers universe. Once the Bouncer’s meter fills up, he will appear from nowhere and fall on the game board with a loud thud, crushing those pesky reptiles under him. To get help from this giant sea monster, you will need to create an uninterrupted fruit match in one move to fill the meter. Summoning Bouncer is not easy. You will need to make a fruit match and that one match should trigger a chain of fruit matches to fill the meter. If the chain breaks before the meter fills up, then you won’t get Bouncer’s help. To fill the meter faster, all you need to do is connect to your Facebook account. Tap on the app to launch it, you can see the Connect button just below the Play button. Tap on connect and enjoy the social benefits of this game. Corals are probably the easiest aquatic creatures to get. You will need to match 4 fruits of the same type to get them. Instead of using a Coral against a lizard immediately after adding it to the board, wait and look for more matches and create more than one Coral to trap moving, shell and mud reptiles. Give them fewer squares to move and then destroy them. You can apply the same strategy to Bitelings as well. Create more than one Bitelings and then wait for the moving lizards to appear in their path, launch them immediately if you more than one lizard trapped in their field of view. Note: If a level has very few moves available and there are too many obstacles then don’t just keep creating creatures with your fruit matches. Focus on removing sand blocks and bushes, especially those that have reptiles. Your aim should also be to get rid of a lizard as soon as possible, so that you will have to deal with only one lizard. Connect to your Facebook account and invite FB friends to get extra Nibblers. They will appear on the board before start of play. The “Invite Friends” link will appear when you start the boss level. It’s not easy to beat bosses and defeating each of these big lizards will be tougher as you progress through levels. Better add a few friends to summon the cute aquatic gang so that they can help you get rid of obstacles and make fruit matches easier. Smash Crab and Puffer Fish are two special, friendly creatures that can help you destroy lizards faster. As the name suggests, Smash crab destroys his target. You just have to tap on your target and Bam! It will smash it to pieces. Puffer Fish destroys a target fruit as well as surrounding targets. However, these two special creatures are fewer in number and can be purchased for premium currency once you have used the free quota. Save them for harder levels, preferably those that throw a mix of harder-to-beat reptiles and too many obstacles. The Mud lizard hides inside muddy tiles and teleports itself to another tile every time you make a match next to him. Restrict him to move between fewer tiles by removing as many mud-filled tiles as possible with your fruit matches. Once he is confined to just two or three tiles, use your aquatic gang to catch him. This way you will have almost all mud filled tiles removed and you can then focus on destroying the mud lizards. Remember that mud lizard levels will ask you to remove all muddy tiles and the lizard. Another, and possibly the best way to get rid of the mud lizard is destroy it whenever you get an opportunity. 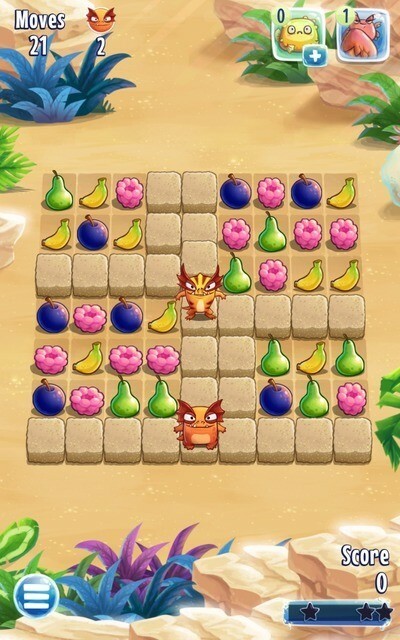 Match 4 fruits of the same type to get Coral, and keep matching fruits to remove muddy tiles. Once you see the mud lizard in the Coral’s field of view, launch her to defeat him. You can then continue removing muddy tiles to complete the second objective. Free boosters appear randomly, especially when you replay a failed level. You will have to watch a 30-second video ad to get a booster. Boosters could anything from block zappers to get an extra marine creature. Use a booster to your advantage and may be it will be easier for you to defeat it.